ALBUQUERQUE, N.M. — If you're ever unlucky enough to have a car with metal tires, you might consider a set made from a new alloy engineered at Sandia National Laboratories. You could skid — not drive, skid — around the Earth's equator 500 times before wearing out the tread. Sandia's materials science team has engineered a platinum-gold alloy believed to be the most wear-resistant metal in the world. It's 100 times more durable than high-strength steel, making it the first alloy, or combination of metals, in the same class as diamond and sapphire, nature's most wear-resistant materials. 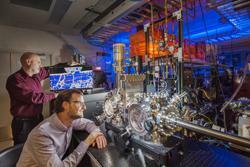 Sandia's team recently reported their findings in Advanced Materials. "We showed there's a fundamental change you can make to some alloys that will impart this tremendous increase in performance over a broad range of real, practical metals," said materials scientist Nic Argibay, an author on the paper. With Sandia's platinum-gold coating, only a single layer of atoms would be lost after a mile of skidding on the hypothetical tires. The ultradurable coating could save the electronics industry more than $100 million a year in materials alone, Argibay says, and make electronics of all sizes and across many industries more cost-effective, long-lasting and dependable — from aerospace systems and wind turbines to microelectronics for cell phones and radar systems. "These wear-resistant materials could potentially provide reliability benefits for a range of devices we have explored," said Chris Nordquist, a Sandia engineer not involved in the study. "The opportunities for integration and improvement would be device-specific, but this material would provide another tool for addressing current reliability limitations of metal microelectronic components." You might be wondering how metallurgists for thousands of years somehow missed this. In truth, the combination of 90 percent platinum with 10 percent gold isn't new at all. But the engineering is new. Argibay and coauthor Michael Chandross masterminded the design and the new 21st century wisdom behind it. Conventional wisdom says a metal's ability to withstand friction is based on how hard it is. The Sandia team proposed a new theory that says wear is related to how metals react to heat, not their hardness, and they handpicked metals, proportions and a fabrication process that could prove their theory. "Many traditional alloys were developed to increase the strength of a material by reducing grain size," said John Curry, a postdoctoral appointee at Sandia and first author on the paper. "Even still, in the presence of extreme stresses and temperatures many alloys will coarsen or soften, especially under fatigue. We saw that with our platinum-gold alloy the mechanical and thermal stability is excellent, and we did not see much change to the microstructure over immensely long periods of cyclic stress during sliding." Now they have proof they can hold in their hands. It looks and feels like ordinary platinum, silver-white and a little heavier than pure gold. Most important, it's no harder than other platinum-gold alloys, but it's much better at resisting heat and a hundred times more wear resistant. The team's approach is a modern one that depended on computational tools. Argibay and Chandross' theory arose from simulations that calculated how individual atoms were affecting the large-scale properties of a material, a connection that's rarely obvious from observations alone. Researchers in many scientific fields use computational tools to take much of the guesswork out of research and development. "We're getting down to fundamental atomic mechanisms and microstructure and tying all these things together to understand why you get good performance or why you get bad performance, and then engineering an alloy that gives you good performance," Chandross said. Still, there will always be surprises in science. In a separate paper published in Carbon, the Sandia team describes the results of a remarkable accident. One day, while measuring wear on their platinum-gold, an unexpected black film started forming on top. They recognized it: diamond-like carbon, one of the world's best man-made coatings, slick as graphite and hard as diamond. Their creation was making its own lubricant, and a good one at that. "We believe the stability and inherent resistance to wear allows carbon-containing molecules from the environment to stick and degrade during sliding to ultimately form diamond-like carbon," Curry said. "Industry has other methods of doing this, but they typically involve vacuum chambers with high temperature plasmas of carbon species. It can get very expensive."